Police Constable (Sports Persons). As per requirement of Uttar Pradesh Police Recruitment and Promotion Board (UPPRPB), total no. of Police Constable Sports Persons posts are 200. Mode of application is online. Starting date of online registration process is 01st October, 2016. Last date of online registration process is 24th October, 2016. Last date of online application fee is 21st October, 2016. Nationality for candidates must be Indian only. 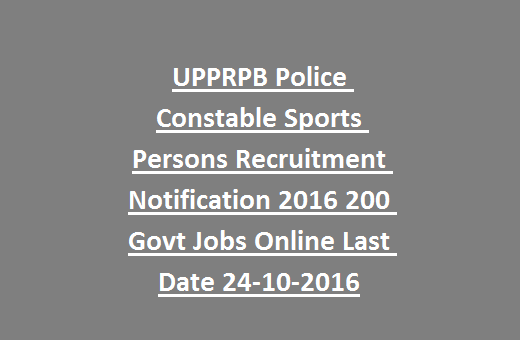 All details of UPPRPB Police Constable Sports Persons Recruitment Notification 2016 200 Govt Jobs Online is mentioned below. As per requirement of UPPRPB, total no. of Police Constable Sports Persons posts are 200. 1. Starting date of online registration process is 01st October, 2016. 2. Last date of online registration process is 24th October, 2016. 3. Last date of online application fee is 21st October, 2016. Aspirants who will be selected for Police Constable Sports Person posts, will get the salary of Rs.5200/- to Rs.20200/- per month and Grade Pay is Rs.2000/-. Job Location for selected candidates must be Uttar Pradesh. Aspirants must have passed High School Exam from UP Board or any other recognized Board. 1. Candidate's age limit must in between 21 years to 25 years as on 01st July, 2016. 2. 5 years relaxation is there for Uttar Pradesh domiciles of Scheduled Caste/ Scheduled Tribe candidates. Uttar Pradesh Police Recruitment and Promotion Board (UPPRPB) Selection committee will conduct Document verification round, Physical Measurement Test and Physical Efficiency Test rounds to select candidates for Police Constable Sports Person jobs. Candidates have to pay the application fee of Rs.200/- through Chalan or Online Payment Mode. Last date of online application fee is 21st October, 2016. 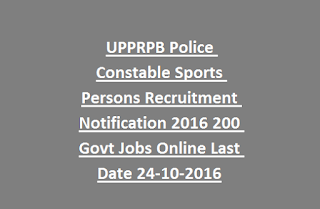 Apply online for Police Constable Sports Person jobs at UPPRPB, Interested candidates may visit official website of www.uppbpb.gov.in and apply online from 01st October, 2016 to 24th October, 2016.